Zion National Park is an excellent place to expand your adventuring repertoire, and a location that many people place on their bucket list for its unique offerings. One particularly adventurous attraction, is the vast and extraordinary climbing routes scattered throughout and around the canyon. In an effort to provide you with an insider look, we asked professional climber and geology expert Fallon Rowe about climbing in Zion and what she recommends for the novice climber all the way to expert. Even if you have never been in a climbing harness, there is still a place for you in Zion National Park. While Zion is known for its many trad climbs and multi-pitch ascents there are many beautiful spots to try your hand at bouldering or regular sport climbing. 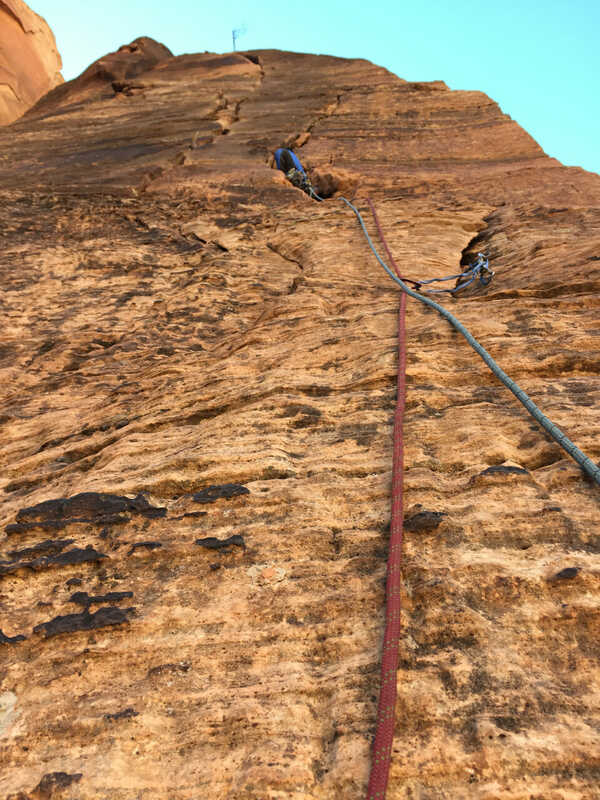 If you have never climbed before we suggest taking a guided climbing tour, there are several businesses surrounding the canyon that provide all the expertise and gear that you need to get close and personal with the grand rock formations the canyon provides. Fallon recommends checking out Cerberus Gendarme, this climbing location provides several routes of all levels that will fit anyone’s sport climbing needs. – Monkey Finger – This climb is a 5/12 big-wall trad climb that is for experienced climbers only. This 9-pitch route has a lot of variety in the climbing so if you only have one day out of your trip to get climbing in, this is an excellent route to try. – Moonlight Buttress – Considered by some to be one of the best trad climbing routes in the world, moonlight buttress is an experienced climbers dream. This is a 10-pitch route that will take all day to complete. Plan to bring lots of water and know that you may need to aid climb on areas of this route. If you are trying out climbing for the first time we recommend going with a guided tour company who can help provide you with the climbing gear you need, but you will still want to pack good hiking shoes, sunscreen, water, a flashlight, and a jacket. The basic climbing gear such as, helmet, harness, shoes, chalk, belay device, and rope are essential to any climb. When going bouldering, it is important that you always wear a helmet and we highly recommend using bouldering crash pads to prevent injury. When climbing a more advanced route you will need to bring at least a double rack of cams and nuts, tape, and be sure to bring extra containers for water. Fallon also recommends bringing a GPS device, as some routes are off trail and the canyon can get difficult to navigate if you end up descending in the dark. Zion National Park can get hot in the summer, so if you plan to incorporate climbing into your trip we suggest going in the early spring (March & April) or fall (October & November). If you decide to go during these times it is essential that you watch the weather reports for rain. Zion provides the unique experience of climbing on sandstone, however, sandstone becomes very brittle and dangerous when wet so be sure to wait at least 2 days after every rain storm before climbing to allow the rock to dry out. If your trip happens to get rained out, there are several climbs on granite in the surrounding areas of the park. When going on a climbing trip it is important to pack light snacks that you can carry with you. You don’t want to eat anything too heavy as it can make it difficult to continue climbing and make your experience less enjoyable. Fallon recommended bringing light packaged items like fruit snacks, granola bars, or trail mix as well as a few items to sustain you in case the climb takes longer than anticipated like protein bars and jerky. Zion National Park provides a shuttle bus throughout their season, so be sure to study the schedule before you plan a climb or hike. The shuttle system shuts down typically around 8 p.m. so be sure to plan plenty of time to get to your bus stop before the end of the night. During the off season for the park, you can drive your personal vehicle to any of the shuttle stops. 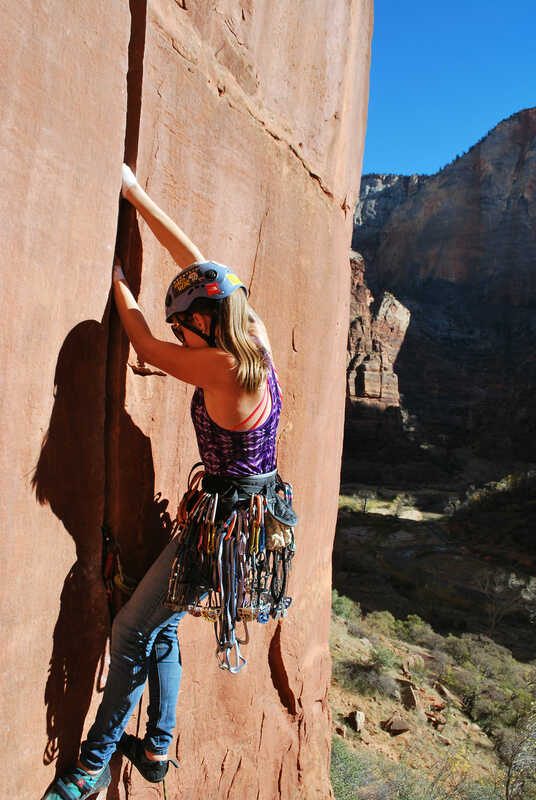 Be sure to let us know if you have any favorite climbs or advice for climbing in Zion National Park!